WARNING: Game includes flashing lights. If you have epilepsy, don't play. You are a disillusioned father who spends most of his time drinking beer and avoiding his family. How long can you avoid them, and at what cost? 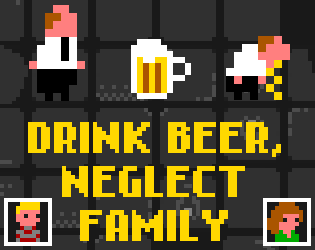 Every beer you drink increases your score, and applies a negative effect. Some beers make you unable to jump, some make you fall off of bridges, some make you throw up every few seconds, and so on. On top of that, pictures of your family pop up everywhere, and you need to avoid them, lest you are reminded of your duties as a father and a husband. 1) LEFT and RIGHT to move. 3) UP and DOWN to climb ladders. 4) DOWN to drop from bridges. 5) +/- to control volume, M to mute.